The groundbreaking engine under the hood of the new-for-2016 Toyota Tacoma has been recognized by a panel of Canada’s top technical experts in the automotive field. Earlier this winter, the Toyota Tacoma earned the 2016 Best New Innovation Technology award from the Automobile Journalists Association of Canada (AJAC), for the advanced technologies found in its available Atkinson Cycle D-4S V6 engine. The recognized technologies operate deep within the Tacoma’s V6 powerplant. Running the Atkinson Cycle in certain situations means Toyota’s new V6 engine delays the closing of the intake valves, effectively shortening the compression stroke of the engine and reducing the effective compression ratio. This has numerous benefits to efficiency, maximizing the extraction of energy available in the fuel supply, emissions, and fuel economy. The late closing of the intake valve is achieved through the Variable Valve Timing system. In simplified terms, the new Toyota D-4S V6 engine can actively vary its compression ratio in response to driver inputs, vehicle load, and other factors. From the driver’s seat, the effect is reduced fuel consumption during gentle driving, with no compromise in power output when it’s needed. 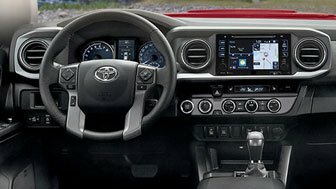 The D-4S system is the other technology at work in the advanced new Tacoma V6. Effectively, this system is comprised of two forms of fuel injection: conventional port injection, where the fuel is injected upstream of the combustion chamber and drawn in, and direct injection, whereby a fuel injector is fixed inside of the combustion chamber, and sprays fuel directly into the cylinder at extreme pressure. Each fuel injection system has benefits and drawbacks in different situations. By utilizing both forms of injection, and enabling the engine to seamlessly switch between the two, compromise is eliminated. In use, the engine computer determines the engine’s operating condition, be it cold start-up, warm-up, idle, partial throttle, or full throttle. Based on current operating parameters, the computer engages one injection system, the other, or some combination of both, finely optimizing maximized power and fuel efficiency in all situations. All said, the new D-4S V6 engine seeks to give shoppers compromise-free access to more power and better fuel economy, with simple adaptations of proven technologies, rather than the use of pricier and more complicated diesel power, or turbocharging. 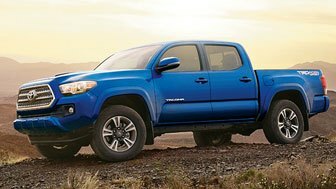 Drivers can expect improvements, all while maintaining the reliable long-term operation and low maintenance costs that the Tacoma is known for. It’s a win-win proposition: the award-winning new D-4S engine is smaller than its predecessor, packs a much-improved 278 horsepower, and burns less fuel to do it. Find out more about the All New 2016 Toyota Tacoma.